Should there ever be a fire in Liberty Square, it is good to know the Philadelphia Contributionship for the Insurance of Houses from Loss by Fire (let’s just refer to it as the Contributionship from here on out) will be there to help pick up the pieces. The Contributionship was created by Benjamin Franklin in 1752. 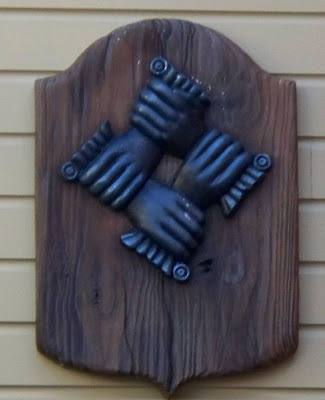 The Contributionship’s firemark, the hand-in-hand symbol seen above, was placed on buildings, usually between two second story windows, as a sign that they were protected by a certain company should a fire wreak havoc on their household. Dues are generally based upon risk estimates for the year, but the Contributionship was unique in that they were the first company to insure against fire, and had no real way to estimate fire damages for the upcoming year. Therefore, Franklin greatly overestimated what damages could be for the year. Consequently, to not scare away clients, he also marked the agreements that if there were any residuals left over from that year could be applied to the next year. As time went on this process created excesses that were used to pay out dividends, in addition to being able to return whole investments if you moved. This became known as perpetual fire insurance. Not a bad way to protect your house, huh? It’s good to know that Walt Disney World took the time to insure these buildings. After all, fires aren’t new to the area, just ask the Settler’s cabin that burned for all those years along the starboard bow of the Liberty Square Riverboat.